Now that I’ve had my all electric Nissan Leaf for 6 months I thought I would start looking at some of the data. I’m installing full logging of GPS coordinates and battery condition shortly but here is a quick chart of the monthly summary for miles travelled and efficiency (the number of miles I get for every kWh of electricity in the battery). The first month I only had it half the month hence the low miles. In January the car sat in an airport car park for a week so that was lower mileage, but you can see as the temperature dropped so has my efficiency (dramatically). I’ll have to plot the average daytime temperature on the graph as well. The cost/mile (given that I charge with night time electricity at 6p/kWh) has hovered around 1.6-1.8p/mile until January when the cold weather and some frequent motorway trips pushed the cost up by 50% to 2.6p/mile. We shall have to see if the warmer weather turns the efficiency line around back towards 4 miles/kWh. I’ve written many times in the past about passive, automatic non-invasive life-logging and sleep is the one area my participants (and I) have been constantly excited about and disappointed. 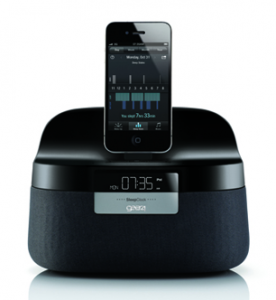 The original popular player in the field, the iPhone SleepCycle app, had great promise and gave some indication of sleep quality for people who slept in a certain way and had a certain type of mattress. As I noted in my review, it fell down in terms of accuracy for some people and in its ability show export its data so I could use it elsewhere. I reviewed and tested many of the wrist actigraphy devices, including putting the fitbit into its bracelet, but it suffered from even more wild accuracy problems (sound sleepers were told they woke up 40 times in the night) and it was quite annoying to use. Certainly the gold standard of consumer sleep monitoring was the Zeo which couldn’t be fooled into believing you were in deep sleep by lying perfectly still. However it was a bit invasive (to say the least) and although it began to allow data exporting for analysis in the months before the company went bust, most participants reported that the data was interesting but the effort involved exceeded the value they got from it in many cases (not to mention the fact that they felt silly wearing the headband. So I was intrigued, if a bit sceptical, when I saw the indiegogo campaign for a passive sleep monitor that actually measured any biometric activity. 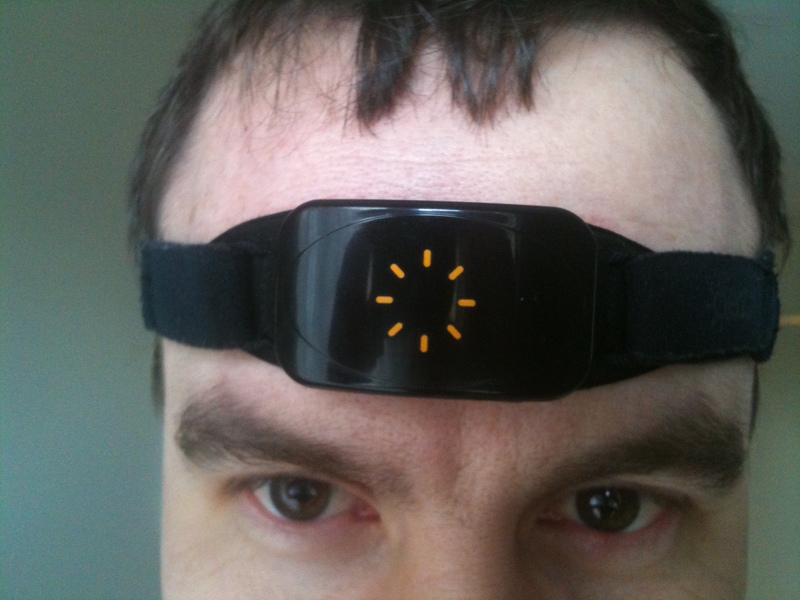 I had tried one other passive monitor, the Renew Sleep Clock, but was disappointed in that in was about as inaccurate as the wrist based accelerometers and also had poor data export capabilities. It relied on ultrasonics to measure movement of the space in front of the clock. 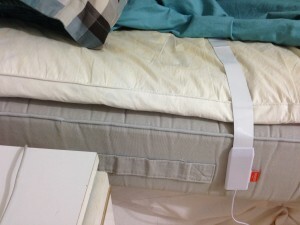 When my Beddit sleep monitor arrived yesterday I was still a bit sceptical. Visually, it is a thin plastic strip that goes on the mattress (in my case a mattress topper) just under the sheet with the control module hanging over the side of the bed. It stays permanently plugged into 900 mA USB power supply which is supplied. The free iPhone app (Android app is apparently on the way but not quite there yet) has very basic controls. 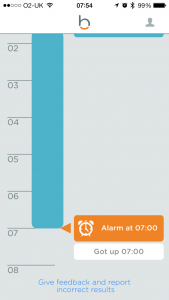 You can optionally enter some physical characteristics and optionally set an alarm time (which I did) but other than that there is just a start sleeping button which starts recording data. Data recording stops when you stop the alarm but presumably you can manually switch off if you don’t use the alarm (will try that tonight). 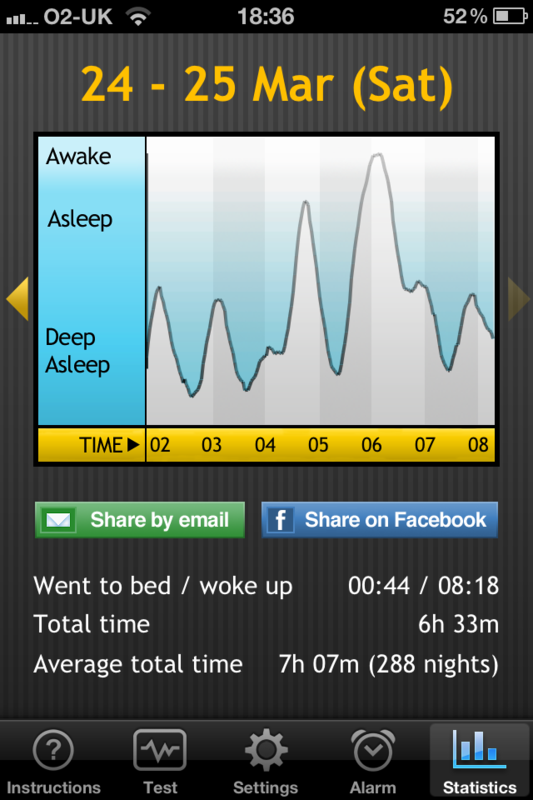 This first version of the app has no data export facility other than the ability to post your sleep score to Facebook or Twitter with some pre-formatted text giving your raw total sleep score, which I’m not complaining about as I know that I’m effectively a post production beta tester. Therefore to show you the results I’ve taken screen shots as I scrolled down the one page of output. On the top of the screen you can see my overall sleep score. I’m not sure what the maximum is or what the scales are but it looks like a percentage and the “coach” suggests that I could do better! 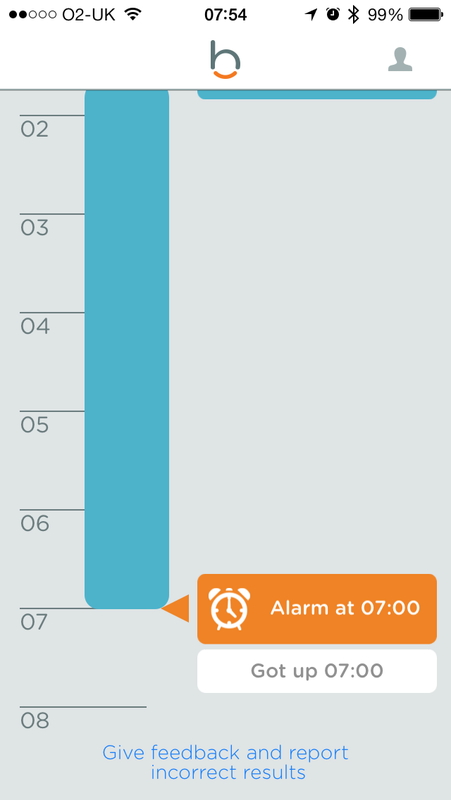 I set the sleep goal in the preferences to 8h but went to bed very late so I below points there obviously, getting only 67 points because that is 67% of my goal (5h23m out of 8h). I guess I could get over 100% by setting a lower sleep goal. I didn’t wake up or get out of bed so I get bonus points there (do they go negative if I do? must check) and my wife will be glad to know that I didn’t snore, although she is away at the moment so I don’t have any independent evidence. Tonight I’ll cross check with my Sleep as Android app which records an amazing set of data and produces lovely graphs of it, including sleep talking and snoring. 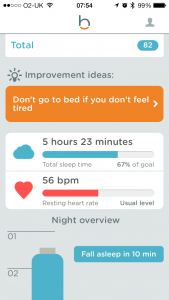 Scrolling down I could open the generic sleep advice but you can get that anywhere, I don’t think it is very tailored to the data yet. 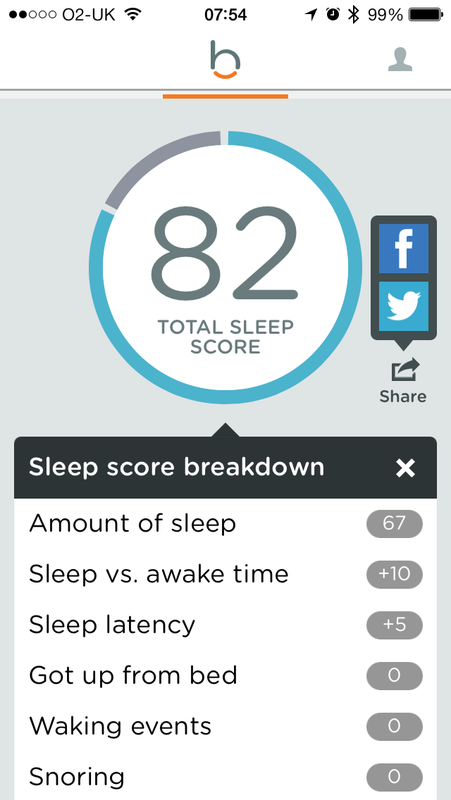 Next we see the sleep total which is where most of my score comes from and my resting heart rate which I was surprised it could do through the sheets. I know from all my other measurements that this is indeed my resting heart rate so I’m already impressed! 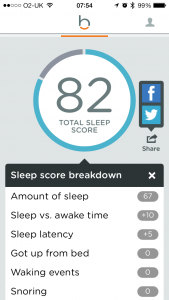 How this translates to sleep quality measurement I will be very interested to see. It seems to have got my time to fall asleep about right (so it beats the apps that sit on the mattress on that score) but other than that the measure of sleep quality remains to be seen. From a convenience point of view it beats the phone apps because it isn’t going to fall off the bed which was the biggest complaint from my particpants and if it records only one person when there are two in the bed that will be an advantage. My wife and I have very different resting heart rates so it will be easy to tell if it is measuring me, so as long as I can remember whether or not I was awake when it says I was then I should be able to check that. So it is a qualified thumbs up from me, but I’m looking forward to being able to get the data out of it so I can do my own analysis. 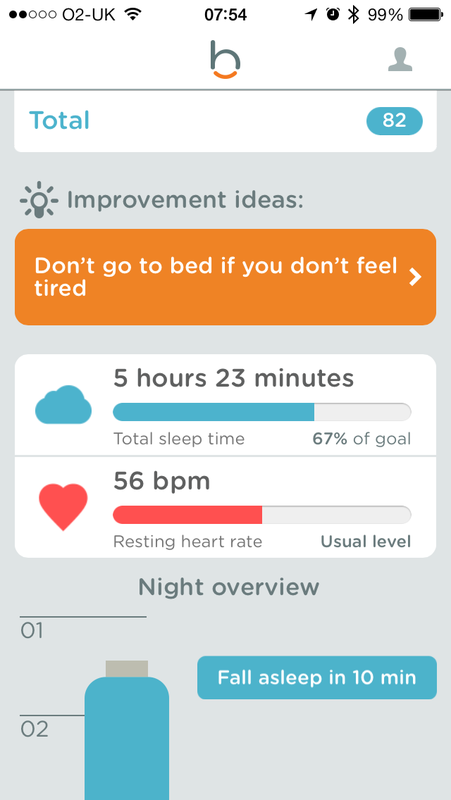 I’ve written before about tracking sleep and my current favourite non-invasive sleep tracking app is still Sleep As Android, but two other crowd funding projects (albeit a lot more expensive) are joining the fray. The Beddit bed scales put four mini-scales under the legs of your bed and not only track your weight automatically (even if you sleep with a partner) but also measures sleep quality using a similar actigraphy method to the wrist sensor and apps on the mattress. Another angle, which, although more invasive claims to have greater functionality, is a Sleep Mask which apparently allows you to power nap and sleep fewer hours but feel more refreshed. This sounds optimistic but if it really works for people then I’m sure there will be a long queue for them! As with many self-monitoring and quantified self commercial products a get a sense of pseudo-science from many so I would be keen to hear if anyone has any experience or can point me to papers on the subject. One of the downsides of most of the social network systems is that they don’t charge you anything–this means that your data is their revenue model and it also means that you have to go to them if you want access to your data. If you want to do something clever with it you can’t export it and play with it.